three × = 6 Required Please enter the correct value. Investors know tech stocks have led much of this current bull market, but there are pockets within the sector that have even greater potential. 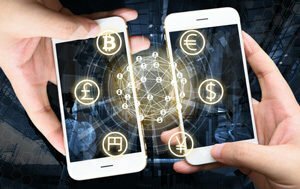 Financial technology, or "fintech" for short, is an area that will touch virtually every aspect of the $70 trillion global economy over the next several years. Today we're bringing you the best fintech stock on the market. And we're so confident in this pick, we think it could double your money. Money Morning Defense and Tech Specialist Michael A. Robinson says online commerce is only going to expand and the real value will be in transactions. People buy things. They take out insurance. They transfer money. And don't forget: Companies sell things online, too. And all of these fall under the heading of "transactions." By definition, every transaction involves some sort of payment. And payments are increasingly going digital. What that means is that almost all financial transactions are ripe for disruption. You see, the next Amazon.com Inc. (Nasdaq: AMZN) will start out building a better mousetrap for some niche in the economy. Better ways to buy a car. Better ways to pay a bill. And better ways to raise money and invest. This is why the fintech industry is going to be huge. You already know fintech, too. That ATM you use to grab some cash was once the greatest innovation in fintech. It seems like a dinosaur today, but savvy entrepreneurs are now riding the fintech revolution deep into the 21st century. According to data from the venture capital trackers at Crunchbase, since 2016, fintech startups have raised more than $15.6 billion. We're also seeing established firms grabbing startups and folding them into their operations. In roughly the last six months, there were at least 30 fintech mergers, according to the online tracker index by TNW. Robinson says that now is the time to look at one company sitting in the sweet spot at the crossroads of transactions processing and fintech startups.